Authentic Experience & Great Insight in the History & Growing Process of Coffee! Costa Rica produces some of the best coffee in the world, and much of that is grown in the Central Valley due to the altitude, climate, and fertile lands. 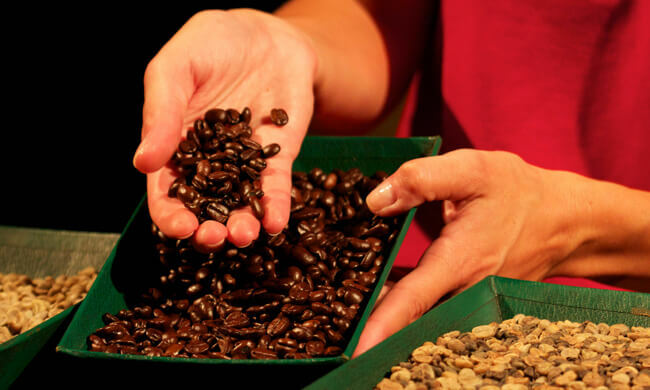 Participating in a coffee tour is great for anyone interested in learning the history and growing process of coffee and also looking for an authentic Costa Rican experience. Café Britt is the premier export-quality gourmet coffee producer in Costa Rica. Many of the hotels you will visit in your time in Costa Rica will offer this brand, so this tour is a great opportunity to learn about the product you are drinking! During this award-winning coffee tour tour, you’ll visit Café Britt’s farm in Heredia, the city of flowers. Your day begins when you are picked up from your hotel and driven 15 minutes to the Cafe Britt Plantation where a local bilingual guide will take you through the life cycle of the coffee bean. You start your tour in the coffee plant nursery where you can learn all about the selection and growing cycle of the bean. Find out how Costa Rica’s unique climate and diverse landscapes provide perfect growing conditions for coffee beans. Then, follow the wonderful coffee aromas through to the roastery. Here you will discover how different roasting techniques affects the beans and the brew. Expert coffee tasters will share their knowledge of the art and science of gourmet coffee appreciation. Enjoy a range of fresh Costa Rican coffee before heading back to your hotel. Of course, you’ll be able to purchase Café Britt at factory prices. Whether you give it as presents or keep it to yourself is up to you! Café Britt is committed to environmental protection, and the tour is Level 4 Certified Sustainable through the Costa Rican Tourism Board).